Photo credit: renophaston on flickr. Although the towering stack of Marvel cards (mostly series 1 and 2) I’ve got stashed away in my closet may suggest otherwise, I’ve never really been a comic book person. Outside of a typical boyhood fascination with super heroes, I never really embraced the culture. Oh, I’m plenty geeky in other ways, but I’ve mostly outgrown superhero stuff (though I’ll still argue that Rogue is the best member of the X-Men). So, while I may not be the most knowledgeable person on the subject, I’d like to spend some time today writing about one superhero that’s a bit different from the rest: Batman. Batman occupies a special place in the superhero universe. For the most part, the back story of most superheroes is quite predictable: a misunderstood child, who has always felt slightly different from their peers, discovers that they have unique innate abilities (superpowers). As they experiment with their new found powers, they further alienate themselves, and come close to losing themselves in their power. Eventually they encounter a mentor, who teaches them to hone these abilities into a controllable, useful form. They then proceed to rid the world of evil, one villain at a time. Their quest may or may not involve the death of their mentor. These kinds of superhero stories are essentially a modern manifestation of a much older story – the hero archetype – which stretches back as far as recorded history, most obviously in the form of mythology. Batman’s different though. Batman didn’t have any special abilities growing up, aside from his ingenuity. Bruce Wayne is just a regular guy – the only thing that differentiates him is the fact that he’s incredibly wealthy. Batman doesn’t use super powers to bring bad guys down. He uses gadgets, equipment, intelligence, and martial arts to get the job done. He also has some important people on his side, without whose aid he probably wouldn’t get very far (the commissioner, Robin, his butler Alfred, Catwoman, etc.). 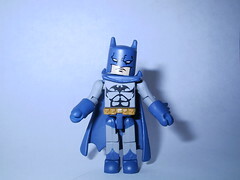 If we’re looking for a superhero to use as a role model for career development, Batman is the obvious choice. As much as you may hear otherwise, you’re not special. If you’re like 99% of people, you don’t have any superpowers. You’re not going to change the world in any significant way. Sure, you’ve got strengths, and you’ll probably help lots of people, but you’re not going to single-handedly save the world. Hard work. Batman had to build an empire before he could fund his crime fighting efforts. Without hard work, that wouldn’t have been possible. A man named Walter Murch said that success in life depends on three things: ability, hard work, and luck. Just one of those things is not enough – and the one most within our control is hard work. The right equipment. What would Batman be without the Batmobile? The Batarang? The Batman costume? The Bat-anything? Just a crazy guy running around, yelling at bad guys. Batman’s equipment is as much a part of his job as anything else. What “equipment” do you need for your career? This doesn’t have to mean fancy technical gadgets – it could be as simple as proper attire. Use your strengths to your advantage. While Batman doesn’t have any superpowers, he unquestionably has strengths. He’s great at hand-to-hand combat. He’s got crippling intelligence and a sense of ingenuity. He’s got remarkable strength, agility, and stamina, which often afford him the element of surprise. Batman uses these strengths to his advantage in his crime fighting efforts. What are your strengths, and how can you use them? A great sidekick. Nobody wants to be Robin, but everyone needs at least one sidekick. Batman has a few, who do you have? Who can you count on to come to your rescue when you bite off more than you can chew? Do they know that you value them as much as you do? Self-awareness. Batman’s not moral perfection, but he’s clear about what’s important to him. He has a clear set of values, and he never compromises. What are your values, and how are they relevant to your career development? What’s important to you? Where are your lines in the sand? If you don’t have an awareness of your core values, you won’t know how to avoid violating them until you already have. We all want to be more like Batman. Without resorting to cosplay, focusing on your career development may be the best way to do just that.